“Consider the Earth’s history as the old measure of the English yard, the distance from the king’s nose to the tip of his outstretched hand. One stroke of a nail file on his middle finger erases human history.” This is the metaphor that writer John McPhee offered in his 1981 book Basin and Range to explain the concept of “deep time,” or the idea that the history of the earth reflects natural changes and evolutions so gradual they cannot be comprehended through measurements such as days or years. Writing in The Atlantic, David Farrier, a lecturer in English Literature at the University of Edinburgh, defines deep time as “the immense arc of non-human history that shaped the world as we perceive it.” To quantify this concept feels almost beyond our grasp: while humans have existed on Earth for a few hundred thousand years, the earth is over 4.5 billion years old. The existence of human life as we know it is a blip in Earth’s history—something we often hear, yet rarely comprehend how shocking it really is. We have geologists to thank for the concept of deep time. Through their study of the earth’s structure and substance in the last 200 years, by looking back at fossils and strata, Earth and planetary scientists have pieced together large swaths of Earth’s natural history, revealing an unfathomably long and ecologically varied past. Most geological research involves the collection, classification, and examination of physical objects— tangible evidence of the earth’s history. But new technologies and big data approaches, connecting previously isolated records through digitization, could revolutionize geological research. Along with artists and writers who portray the natural world, big data could transform the way we represent deep time, both literally and conceptually. With the specter of climate catastrophe looming, a shift in the way we think about deep time can help us reframe our understanding of humanity’s place in Earth’s history. In December 2018, the International Union of Geological Sciences (IUGS) approved an emergent project called Deep-time Digital Earth (DDE) to create a digital, all-encompassing network of Earth Science databases in order to emancipate data from inaccessible physical collections. Currently, most geological data are stored in analog collections such as the British Geological Survey’s (BGS), which holds millions of fossils in boxes in colossal industrial warehouses in Nottingham, U.K. DDE is not the first effort to digitize geological records on a large scale, but it seems to be one of the most promising: while other efforts have largely been directed by American and European scientists, the Chinese government, which oversees significant Earth Science research endeavors, has agreed to support DDE, providing crucial funding and access to vast amounts of data. At a February meeting of international Earth Science organizations in Beijing, 80 geoscientists hoped that DDE might be usable by the International Geological Congress in March 2020. Professor Fischer believes DDE might look most like EarthCube, one such initiative of geoscientists and the US National Science Foundation, which aims to “transform geoscience research by developing cyberinfrastructure to improve access, sharing, visualization, and analysis of all forms of geosciences data and related resources.” EarthCube-affiliated organizations have digitized a wide variety of Earth Science datasets, such as records of grain size of transported sediment, soil moisture near well holes, and rainfall nutrient fluxes, among many others. EarthCube projects include an attempt to integrate data from multiple paleobiological databases. Creating a more comprehensive visualization of Earth’s fossil record, it combines practices of geoinformatics and bioinformatics, to develop an integrated data system for geological field sciences that incorporates data from multiple sub-disciplines. EarthCube incorporates a wide variety of data to piece together a digitized understanding of Earth's systems, creating a fuller picture of Earth's historical and present conditions. Like EarthCube, DDE will attempt to use big data to integrate our understanding of Earth’s systems to digitally encompass and represent the span of deep time. According to Michael Stephenson, a paleontologist from the BGS who was quoted in Science Magazine, the “idea is to take these big databases and make them use the same standards and references so a researcher could quickly link them to do big science that hasn’t been done before.” In the eyes of IUGS, DDE will be “a new scientific paradigm for research.” DDE will be an open platform, meaning that it will use an accessible interface, and will comply with aptly named FAIR principles (Findable, Accessible, Interoperable, Reusable) for scientific data management. While deep time was originally a discovery insular to the scientific community, in the 20th century, historians and writers of science like John McPhee brought the concept into the public imagination. But without an understanding of geological history—and sometimes even with this understanding—the concept of deep time remains almost impossible for most people to grasp. Stephen Jay Gould, popular biologist and science writer, argues in his book, Time’s Arrow, Time’s Cycle, that humans can only truly comprehend deep time through metaphors, which relate the elusive concept through understable references. In a 1903 essay, Mark Twain offered another illuminating metaphor: “If the Eiffel Tower were now representing the world’s age, the skin of paint on the pinnacle-knob at its summit would represent man’s share of that age.” By shifting deep time to the realm of the comically minuscule, metaphors like this allow us to bring it within our grasp. At the same time, though, they shrink the concept so much that they obscure its magnitude. But even a numerical quantification of the earth’s history does not help people internalize the idea of human transience. As McPhee explains, “Numbers do not seem to work well with regard to deep time. Any number above a couple of thousand years—fifty thousand, fifty million—will with nearly equal effect awe the imagination to the point of paralysis.” Without metaphor, the hundreds of thousands of years of human life on Earth feel just as innumerable and beyond our imaginations as the multiple billions of years of the Earth’s history. In this way, our inability to comprehend deep time prevents us from seeing the history of the Earth in its totality: we fail to comprehend the world as bigger then us. Both artists and scientists have grappled with the problem of representing these ideas. In 2014, the National Academy of Sciences curated an exhibit that brought together artistic interpretations of deep time, such as paintings, photographs, and sculptures at their facility in Washington, D.C. The pieces in the exhibit ranged from abstract light sculptures, topographical maps, and photographs of rock formations, among others. The curators argued that art, similar to metaphor, is a “way of knowing” for scientists, and is particularly important for geologists: “Art creation—something as simple as making a mark on a piece of paper—is a cognitive act…the act of drawing a rock formation creates a connection and understanding that is more informative to the student than other forms of documentation and recording.” Photographers, whose mimetic work by nature forces them to confront the potential pitfalls of literal representation, have offered special insight into what it means to visualize deep time. Terry Falke, whose photograph of three cyclists observing a large rock formation is included in the National Academy of Sciences exhibit, suggests that to consider deep time requires humans to step outside of our frame of reference: “A person would have to take themselves out of the human context to begin to think in terms of geologic time. They would have to think like a rock.” Human time, as Falke implies, presumes the notion of dominion, whereas rock time has no conception of a hierarchy of life on Earth, or of the centrality of one species—rock time emcompasses totality. What does it mean to understand the world on a geological timescale? Deep time is not only beyond comprehension because of the challenges of representation, but also because it profoundly destabilizes dominant Western worldviews. Deep time demands that we fundamentally reconsider our understanding of history, and upends foundational Biblical and anthropocentric narratives of the world. The Biblical vision of human life, posits human life as separate from, and supreme over, the natural world: “Then God said, ‘Let us make mankind in our image, in our likeness, so that they may rule over the fish in the sea and the birds in the sky’” (Genesis 1:26). While Biblical time centers humans in the history of the Earth, deep time, which is akin to the rock-oriented timescale Falke described, deflates our importance. Though the roots of the human-centric view of Earth’s history extend as far back as the Bible, we are living in a distinct age of human life on Earth. Scientists have described our current geological age as the Anthropocene, meaning that human activity has been the dominant influence on the climate and environment. Some date the beginning of the Anthropocene to the development of agriculture 10,000 years ago or to the mid-19th century Industrial Revolution, but many have settled on the Great Acceleration of the mid-20th century, when human population and consumption boomed. In the age of the human, where the anthropocentric view of the earth is backed up not only by religious mythology but also by scientific expertise, our failure to conceptualize deep time results in a distorted vision of our minuscule place in the world, and thus obscures our understanding of the implications of human-caused climate change. Photographer Emmet Gowin, who was quoted in the National Academy of Sciences exhibit, has articulated the need for humans to consider deep time in the context of Biblical narratives and climate change: “Man cannot afford to conceive of nature and exclude himself.” Gowin's work, which depicts human impacts on the natural world, such as man-made disasters, and abandoned factories and nuclear plants, forces us to confront the often devastating wounds humans can inflict on nature. His photographs reveal the dire consequences of imagining ourselves outside of nature. Multitudes of scientists concur: as documented in the New York Times’ longform report on climate change, “Losing Earth,” humans’ industrial practices have warmed the globe more than one degree Celsius in the last 200 years. A warming of five degrees, which many climate scientists believe is a reasonable possibility, has ignited very real fears of human extinction. And so, the seeming inevitability of enviormental catastrophe demands critical reflection. Climate change-induced fatalism is prompting us to shift our thinking about the Anthropocene and the place of humanity in the Earth’s history. As historian Dipesh Chakrabarty has argued, “anthropogenic explanations of climate change spell the collapse of the age-old humanist distinction between natural history and human history.” To reckon with the concept of deep time means to situate ourselves in Earth’s history and to imagine both the past and the future. In our current era, where capitalist modes of thinking emphasize short-term rewards over long-term consequences and the prospect of climate catastrophe makes the future of human life on Earth appear uncertain, the need for this reckoning is increasingly pressing. This reckoning is only possible if we use all the tools at our disposable to understand our place within geologic history, rather than outside of it. Despite metaphorical and artistic attempts to understand and represent deep time, we do not seem to have internalized the concept. DDE, an inward-facing, expert-oriented tool probably will not revolutionize the concept of deep time: it will be a very useful tool for helping scientists conduct research, but most people will not have access to it. But DDE, might, however present an answer to the problem of representation. A big data approach that incorporates the vastness and human incomprehensibility of data might be the closest we could come to representing deep time. If big data allows us to move past metaphor or artistic depiction into the realm of actual visualization, it also allows us more easily to conceptualize Earth systems and Earth’s history in totality. Perhaps the most pressing consequences of changing the way we understand the Earth will concern the way we think about (and thus take action on) climate change. DDE could enable significant innovation in climate science that, optimistically speaking, might inform policy approaches, or, from a more realistic perspective, allow us to predict future natural disasters precipitated by climate change and mitigate their impacts. But if DDE, or any of the other big data approaches to visualizing geological history, changes the way we situate human life in our understanding of the earth’s past and future, our conception of the implications of climate catastrophe must shift. Human-induced climate change might end the Anthropocene and human life as we know it, but the history of the Earth is much larger than humanity. As journalist Alan Weisman argued in his book The World Without Us: “Without us, Earth will abide and endure; without her, however, we could not even be.” If we understand human life in Earth’s history as the tip of a fingernail on an outstretched arm, or a coat of paint on the Eiffel Tower, the end of our era feels somehow more natural or cyclical. This shift in our understanding of deep time does not mean that climate catastrophe should not feel tragic—the impacts of climate change will certainly be excruciatingly painful, and as long as we can act, we should attempt to mitigate these impacts. Nor is this to say that our ecological crisis is outside of human control: politicians often weaponize arguments like this to deny humans’ role in environmental degradation, and valorize the system of capitalism that engenders it. But with the long view of history in mind, we can understand that our climate catastrophe—and even the end of human civilization—is not totality. If we can visualize deep time, we can remove ourselves from the center of our narrative. Only then can we begin to imagine ourselves as perhaps not inconsequential, but fundamentally ephemeral, and find some sort relief in that. 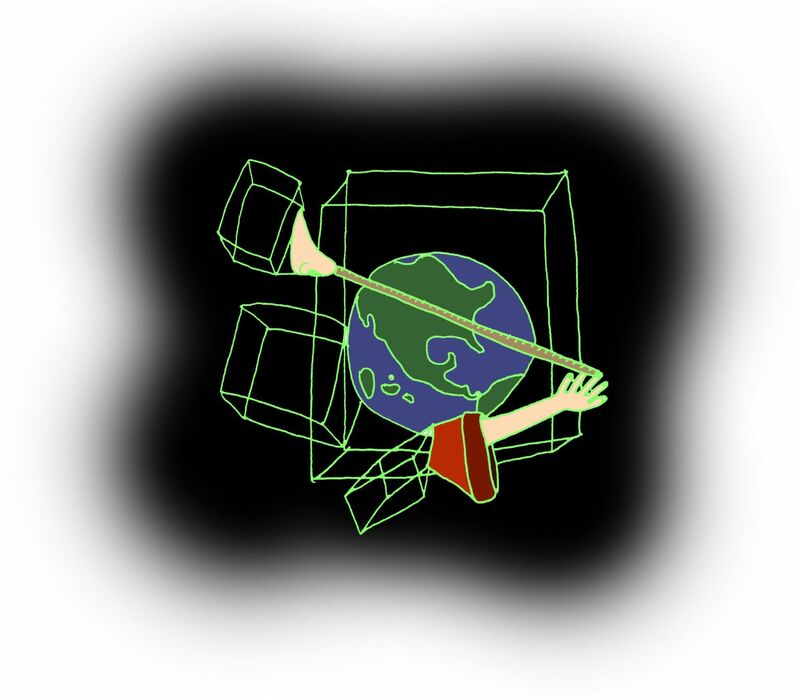 GEMMA SACK B’21 is thinking about the Voluntary Human Extinction Movement.